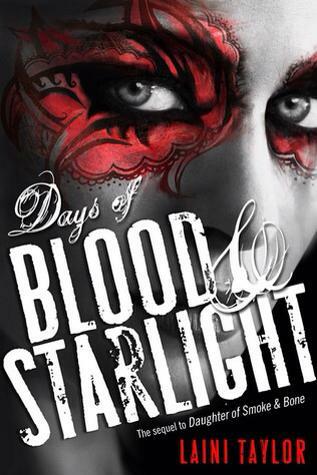 “Days of Blood and Starlight” is the second book in the Daughter of Smoke and Bone Trilogy by Laini Taylor. The title itself will clue you in on the death, chaos and destruction that abound in this book. There’s just so much of it that I started to wonder if this was really Laini Taylor or George R. R. Martin I was reading. The war between the angels and the beasts rages on, deadlier and more horrific than ever, and Karou finds herself fighting alongside her people, the Chimaera. She plays the very crucial role of Resurrectionist, taking over Brimstone’s position of resurrecting fallen soldiers and putting them in new bodies. To fight and kill again. It’s the only reason why Karou is still alive. It’s the only reason why the Chimaera tribe is still standing against the formidable forces of the Seraphim. For every Chimaera soldier they slay, a Chimaera soldier is hiding in secret to retrieve the souls and put them inside thuribles to preserve them until resurrection. It’s the only reason why other Chimaera soldiers tolerate being around Karou despite her treason all those years ago. The Warlord Thiago seems benign and appeasing around her, but Karou knows better than to trust the same beast who put her to the stand and ended her life eighteen years ago. I enjoyed this book so much better than the first one. I seriously didn’t know which side I’m on. The plot just got thicker, the action just got bloodier, and the future just got a whole lot bleaker for Karou and friends. Oh, the last book will be a good one.